There was formerly a custom in Cornwall of electing a Mock Mayor. 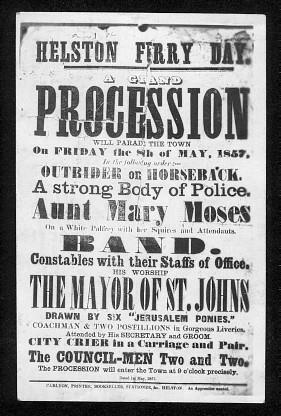 Many years ago the late Mr. A.H. Hawke, the well known Helston Photographer, produced a photograph of a poster announcing a procession into the town by the Mock Mayor of St. John’s. from the Seat of War in full uniform. A strong Body of Police. on a White Palfrey, with her Squires and Attendants. Constables with their Staffs at Office. dressed in the full uniform of a Turkish Warrior, armed with a Turkish blunderbuss, with which he killed 15 Russians in one engagement. Secretary and Groom, Coachman and two Postillions, in gorgeous liveries. City Crier in a Carriage and Pair. The Procession will enter the Town Hall at 9 o’clock precisely. Dated 4th May 1858. Canyon, Printer, Bookbinder, Stationer &c., Helston. Robert Hunt F.R.S. in `Popular Romances of the West of England’ in his index under `Old Usages’ refers to Sham Mayors but only lists three places. Unfortunately, St. John’s is not one of them. Alistair Murray recently sent in these photographs from the original postcard by A.H.HAWKE of the 1857 celebrations. It appears that the postcard is almost identical to that mentioned by `TOY` in his History Of Helston.